The VEA Fund for Children and Public Education is the voluntary political action arm of the Virginia Education Association. Our mission is to help elect friends of public education to state and statewide offices. The VEA Fund makes campaign contributions to candidates running for the offices of Governor, Lieutenant Governor, Attorney General, and in the General Assembly. The VEA Fund plays a crucial role in making sure public education values are at the forefront of candidates’ campaigns in Virginia. Our recommended candidates are often up against well-funded special interests that want to take Virginia’s public education in a direction that would hurt our educators, our communities, and most of all, our students. With a strong VEA Fund, public education advocates can elect champions to office and defend our values. What is the VEA Fund for Children and Public Education? The VEA Fund is the political action committee (or PAC) of the Virginia Education Association and works to elect candidates to state and statewide office who are champions of public education and who share the same policy priorities as the VEA. The VEA Fund recommends candidates based on the recommendations of local PACs in the various legislative districts across the Commonwealth and uses funds raised to support those candidates and ensure their electoral success. To earn the VEA Fund’s recommendation, candidates must submit a candidate questionnaire, interview with the appropriate committee, and receive the final vote of approval by the majority of local PAC representatives. What is the primary goal of the VEA Fund for Children and Public Education? The primary goal of the VEA Fund is to elect a majority of pro public education candidates to office in Virginia’s General Assembly and statewide offices, thus building more power to advance and defend the values of public education advocates across Virginia. To do this, the VEA Fund solicits and accepts donations from VEA members, retired members, and members of the public who share the same vision for delivering a quality public education to every child Virginia, regardless of where they live. Who can give to the VEA Fund for Children and Public Education? Any supporter of public education who shares the values and vision of the VEA Fund can donate. Per Virginia law and for campaign finance purposes, donors must disclose their name, address, occupation, and employer at the time of their donation. Can VEA membership dues be used to support the VEA Fund for Children and Public Education? Member dues to the Virginia Education Association are not used for purposes of direct advocacy of candidates and are not utilized by the VEA Fund. 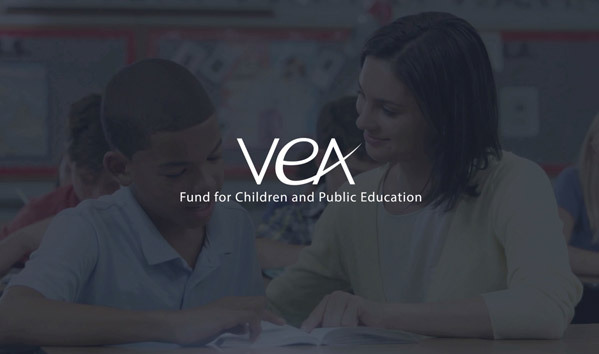 How does the VEA Fund for Children and Public Education use the donations it receives? The donations received by the VEA Fund are used to elect pro public education candidates to office. This means making direct contributions to recommended candidates’ campaigns and making expenditures to spread public awareness of the values and priorities they represent. Political campaigns are expensive. This means the VEA Fund’s work to elect public education champions through financial support is even more meaningful and further ensures the policy priorities represented by public education advocates remain at the forefront of the candidates’ campaigns. Electing more public education champions to office will allow advocates to stop playing defense, and instead work offensively to solve the many challenges that our public educators and students face today. What is the easiest way to support the VEA Fund for Children and Public Education? Monetary contributions are the best way to support the work of the VEA Fund. You can make a onetime donation or you can sign up to make a monthly contribution to best sustain the VEA Fund’s long-term efforts. You can contribute today by clicking the “donate” button on this page. How is the VEA Fund for Children and Public Education governed? The VEA Fund is governed by an Executive Committee, which is made up of one elected representative from each Congressional District, two elected at-large members, one member from VEA-Retired, and the VEA President and Vice President serving as Chair and Vice Chair, respectively. To be elected to the Executive Committee, one must be a VEA member or retired member, and must be a contributor of the VEA Fund. Elections are held annually and members of the committee are elected to two year terms. The Executive Committee oversees all funding and recommendation strategies and decisions. Final votes for candidate recommendations, however, are taken by designated persons from the local PACs across Virginia.